As I have described in the previous post , Here is the Recursion Tree of the Tower. If you are able to draw the recursion tree of a a problem you will be able to code that too very easily. This Tree is self explanatory , In this we have Decomposed the 3 Disc problem into 3 steps and recursively solved the same. So, Now we can write the Program for the same , It does not depend which programming language you use to code , the algorithm will be the same. 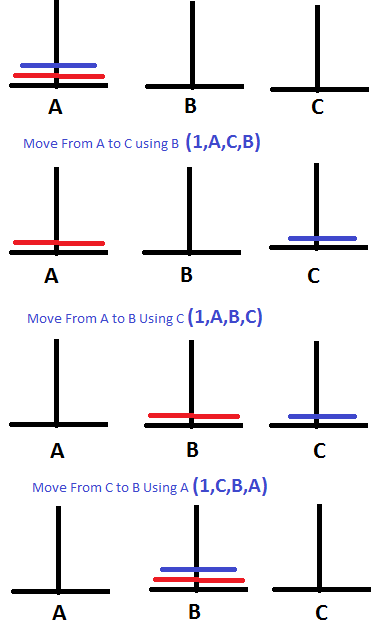 Tower Of Hanoi Algorithm Implementation. 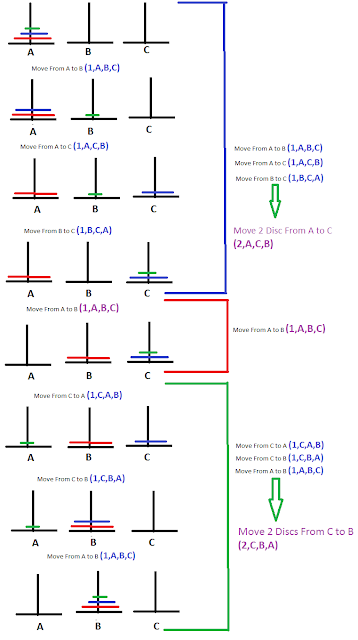 Today I will try to explain the Tower Of Hanoi Algorithm in Full detail. I don’t want you to just mug up the 3 lines of code and pass an exam . I want you to learn How we reach to the solution. How we decompose the problem and recompose it again to get the solution which is very important to solve a problem like this. You will also learn how to apply the recursion to get the desired solution. We have Three pillars/pegs and N discs of different size on One pillar/peg such that They are in Incresing order of size from top to bottom. We have to move the Discs from Source Peg to Destination Peg keeping the following constraints in Mind. 1. )We can take one peg out at a time. 2. )We can’t place small disc below the larger one during the task. 3. )We can only use one more pillar for help to complete the solution. We have described the problem the solution above. Now we have to think how to solve the same. 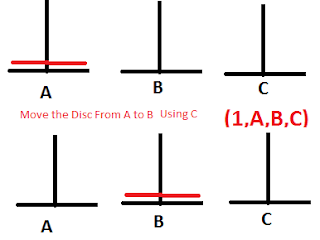 Let us Assume that we have only one Disc On peg A and We have to move the same to the Peg B.The solution is obvious , We will just pick the disc and put it on B and the problem is solved , let us see the same in Picture. 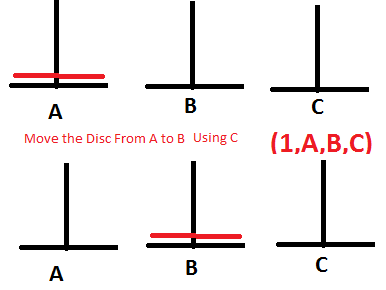 (1,A,B,C) denotes that we have moved 1 disc from A to B using C.
SO, (1,A,B,C) solves the One Disc Problem. Now , Let Us Assume that We have Two Disc and We have to move both disc from A to B. Let us see the solution of Two Disc Problem in Picture. Now Let us Take the 3 Disc Problem, Now we have to move the 3 discs from A to B. So, In this way we have decomposed the problem into three parts to solve it. 1.) (n-1,From,Via,To) -- first solve the problem of moving n-1 discs From to Via . 2.) (1,From,To,Via) -- Then solve the problem of moving 1 disc From to To. 3.) (n-1,Via,To,From) -- Then Solve the problem of moving n-1 disc from Via to To back. We can also draw the Recursion Tree of the problem Here. 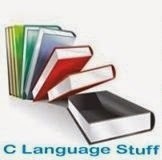 Today I am going to explain the most important concept of C language. What do you mean by storage class in C? How many storage classes are there in C? Explain the different storage classes in C ? So, I will be explaining the storage class concept in full detail with all its types. Let us start by understanding What it means by a Storage class? Lifetime: Lifetime of a variable defines "till what time we can access a particular variable". Scope: Scope of a variable defined "Where we can access a variable in our hundred and thousands lines of code". Default value: what is the default value of the variable when it is only declared that is programmer has not assigned any value to it explicitly. Storage place: Storage of a variable defined Where the variable is getting the memory to be accessed. So, We can say that Storage class is an attribute/specifier which defines Lifetime,scope,storage and default value of a variable. telling about all the four properties of a variable. Explanation of all the classes coming soon one by one. 1. )POSIX thread IDs are assigned and maintained by the threading implementation. The thread ID returned by gettid() is a number (similar to a process ID) that is assigned by the kernel. 2. )ID generated by the pthread_self() can be used after the completion of the thread but the ID genereated by the kernel can't be used even after the completion of the thread..
We can get the ID of the thread by using the funciton pthread_self() on the running thread. The main point about this function is :It uniquely identifies EXISTING threads,Here EXISTINGhas a special meaning..The meaning is pthread_self() return the value which can be reused across the program that means if you have created a thread and it completed its execution then the id of that thread can be used as the id of another thread..